One of the truly incredible things about Nature is how it can continually surprise you. There are patterns, to be sure, a certain predictability in pathways, behaviours, timing. But often, when you are out looking, exploring, and expecting things to unfold a particular way Nature throws a surprise party in your lap. 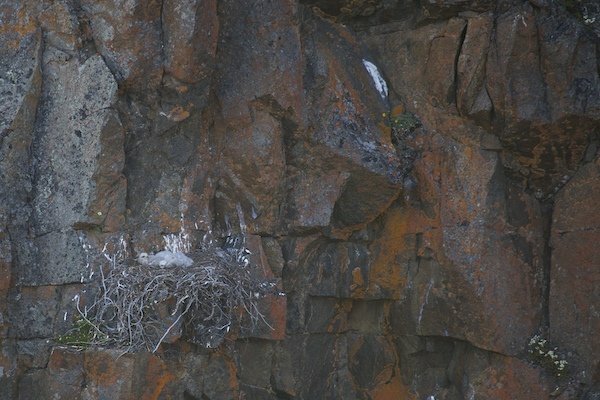 Recently a friend led me to the vicinity of a Rough-legged Hawk nest. His description of being harassed left little doubt that there was one in the neighbourhood. Sure enough my sharp-eyed son casually pointed it out to us… “that nest?” (said in a 10 year old voice that implied “Work on your observational skills okay guys”). Situate across a small canyon carved by a steep stream it made for excellent viewing, at eye level right across the small chasm. “That nest?” . Eyasses are still in fluffy down. There are at least three species of wildflowers clinging to this cliff by the way. Over the course of several trips I watched the eyasses turn from mostly fluffy chicks to fully feather, and this past weekend I went out assuming to find an empty nest. The young birds had looked like they were ready to fledge, the season is getting late and they looked ready to leave. Lemmings make up the bulk of the diet here in the Arctic. 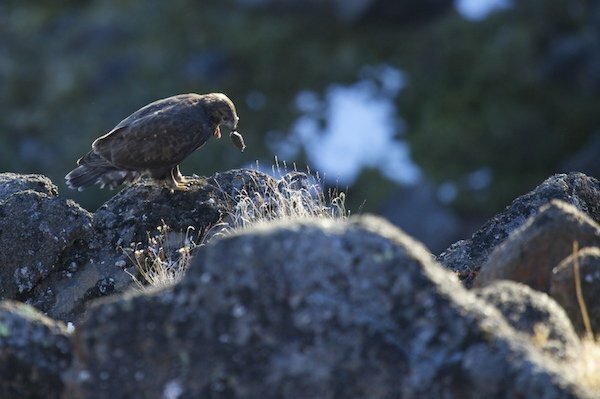 One of the chicks tackles a lemming seemingly too big for it. When I walked down I wasn’t surprised to see the empty nest and I stood and listened for the screams of the parents, which never came. I half-heartedly searched the opposite side for the fledged birds and turned to climb back out. But when I turned and took one last look, my first surprise. There, on my side of the stream, quite near, was one of the fledglings. 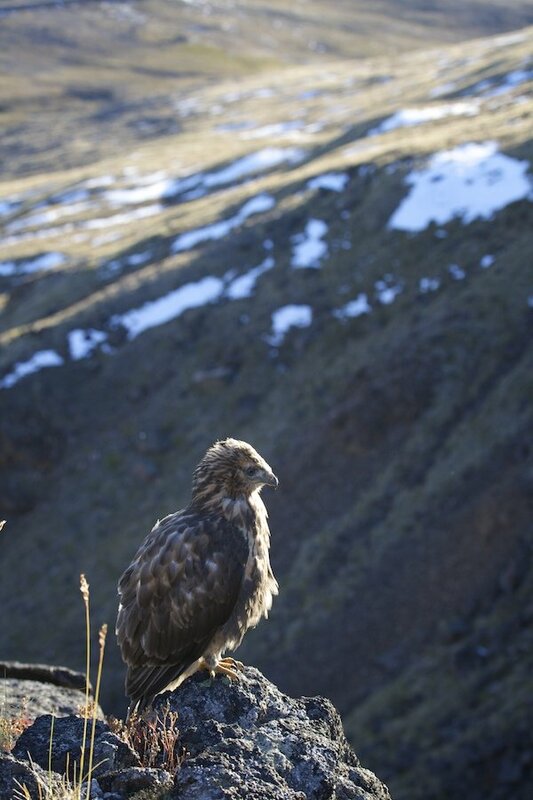 Soon to be master of all it surveys, a young Qajuuq sits over looking the valley. I made my way slowly closer to it, fully expecting it to take off, but it didn’t. It seemed very casual about my presence, almost at ease. Perhaps it was used to me after watching me from the other side over the course of several visits, perhaps its calm demeanor belied its fear, or perhaps it was just too newly fledged to try and flee. It watched me, calmly, until I sat down about 7 feet away (almost at minimum focusing distance) and we both regarded each other, and I occasionally raised the camera and snapped off another frame. Up close. This was taken almost at minimum focusing distance. 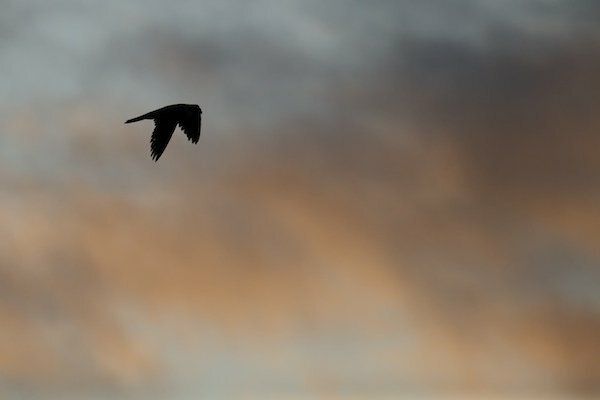 Another of the fledglings flies over and lands nearby. Then came the bigger surprise, one of its siblings flew in from the opposite side and landed a little further away. As I snapped photos of it it began heaving as if it were throwing up, and in a way it was throwing up. For while I took pictures it heaved up a pellet of undigested lemming. A tightly packed pellet of indigestible parts, hair and bone. I, to that point, had had no idea that hawks did that. I knew that it was a behaviour that was common in owls but I had never even heard of it with hawks before. “Well, I won’t be needing this any longer” Up until this moment I did not realize that not only owls upchucked undigested pellets of bone and fur. I stayed a little longer, then went and got Travis (who had stayed at the truck playing) so he could experience this close encounter. Then we headed home, leaving them in peace. A couple of days later I found myself down along the shore, where the a small river that empties our water source enters the ocean. I had hoped that there were still some shorebirds left, or some of the later migrants, such as Ruddy Turnstone and Purple Sandpiper had arrived. It was deathly quiet. The last time I was here was during our first major snow storm of the year, a miserable day but one I knew would be great for finding the birds were left. A handful of young Baird’s Sandpipers were there, and a larger plover flushed at my feet. Black-bellied or American Golden were the likely candidates, but by the time I got the caps off my binoculars and turned I lost it in the storm and the waves. This time there were nothing but the gulls that congregate there in the Fall. As I walked along the ocean’s edge I looked ahead with my bins to see if any birds worked the shoreline. And there was the next surprise. 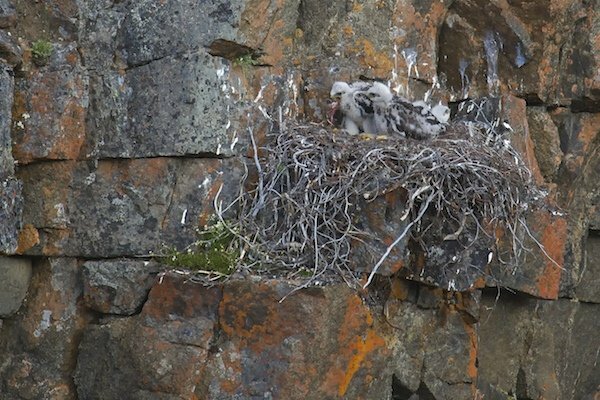 For sitting in the middle of a stream of the river was a Peregrine Falcon, eating the young Thayer’s Gull it had brought down. (Explaining the commotion they were making as I arrived). It, of course, knew I was there. It had no doubt seen me long before I had an inkling it was around. There was no place to hide, so I simply inched closer, step by step. Pausing when it looked nervous I snapped away, eventually having to delete images on my card in order to continue. Finally it had enough and sprung into the air. 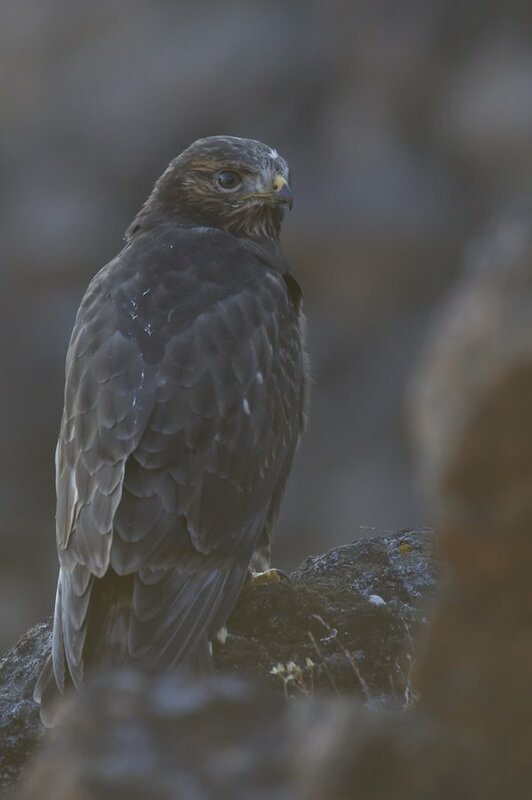 It circled me a couple of times, and then perched on a boulder and waited until I left to resume its meal. 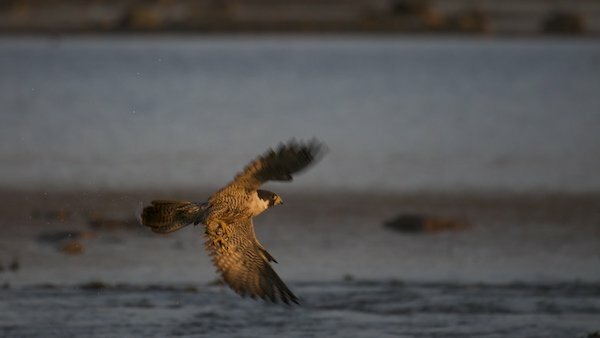 It allowed me closer than I could have imagined, my second close encounter with iconic Arctic raptors in as many days. Surprise is a good thing. Rarely do they work out this well. 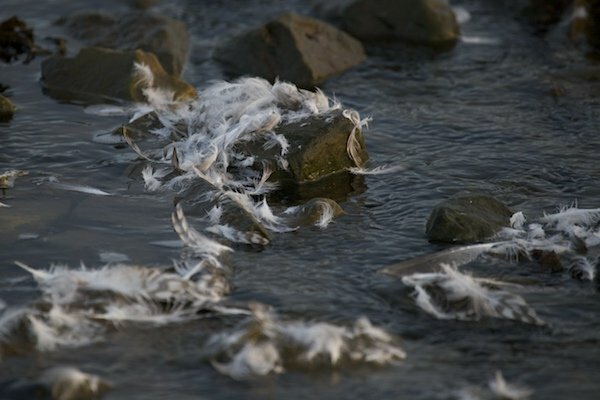 Feather’s from the kill float in the water. Beautiful. Ten years ago, I lived in the Mission Valley of Montana, about 45-50 miles north of where I do now in Montana. Very much enjoyed the congregation of Rough-leggeds we would get every winter, where they could live off the vole population. 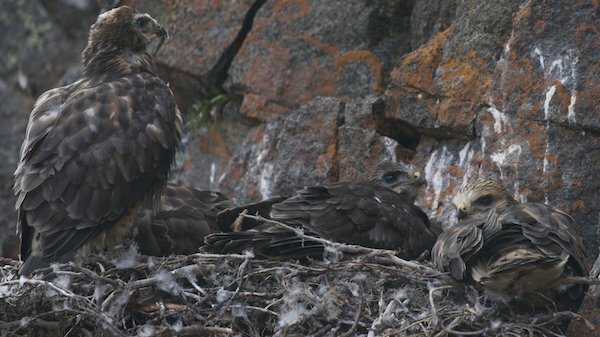 How wonderful it must be to see nesting Rough-legged Hawks and to be able to observe and photograph them as they grow. I see them here in Utah in the winter and they are great subjects to photograph. 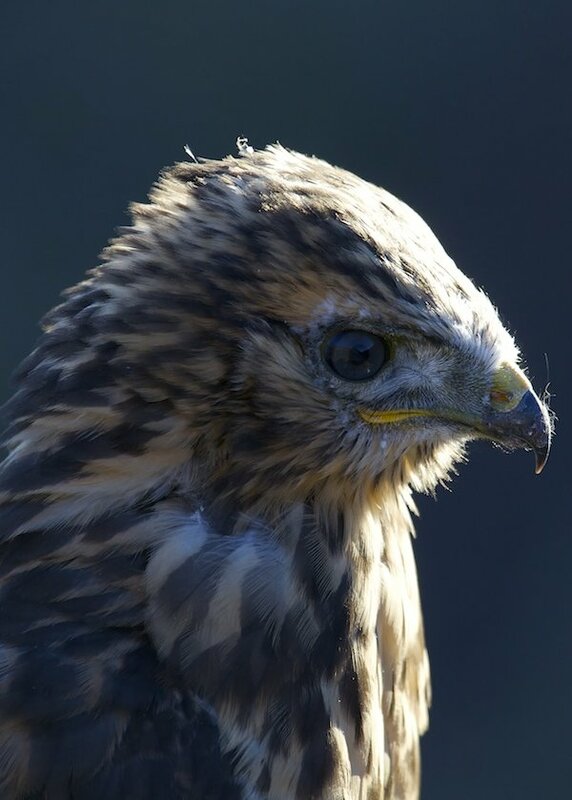 Ferruginous Hawks also have feathered tarsi, the only Buteos in North America that do. We didn’t know hawks coughed up pellets either, but don’t we all learn so much from observations and maybe it is not documented yet?! @Mia Gah! How could I forget about Ferruginous Hawks. I’ll have to go back and fix that. Thank you. @Clare, when I asked on line a friend sent me a link about Heron’s coughing them up as well. Travis and I went back and collected one (not the same one I believe but found nearby). It is soft, reminiscent of felt, which I guess makes sense. Beautiful photos, Clare, and a great experience. I knew birds other than owls coughed up pellets, but I’ve never seen it happen myself. Thanks John. Bit of a surprise for me, but I dearly love surprise. I really, really like that line. Lovely post as always, Clare. No Roughleg for me this year – yet. Clare, glad I could help with the feathered tarsi. Gorgeous photos, especially those close-ups and the scattering of feathers! I just saw three Black-bellied Plovers here on the Olympic Peninsula for the first time in a few months. Thanks Jochen. The Rough-legged Buzzards will come. I suspect they are on their way now. Cool series of photos Mia. Haven’t seen a shrike since I left the NWT to come north. Very cool birds, loved having one at my feeder, worth the few redpolls it took. Thank you Wendy. I’ve been striking out on the larger plovers here. Such is life, I think I need to spend more time upland in the spring than I do.